Look at that psuedotachylite! 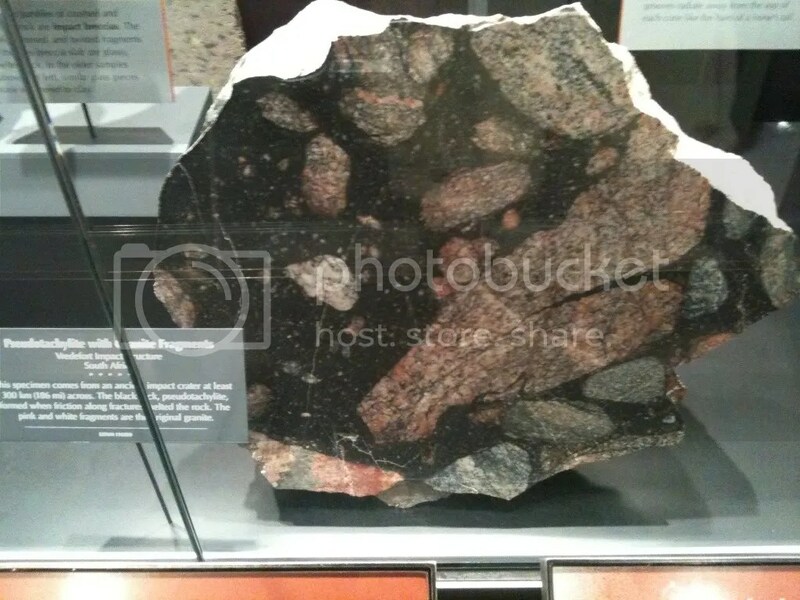 I like to think of this as impact-breccia, as it formed during the impact of a meteorite. The pink rock is the original granite that broke off into melted rock (the black part) which melted from fracture friction. Pretty sweet looking example of the Leesburg conglomerate. We have come across this formation during our excursions, but never got this great look of the interior all nicely polished. How much is it for a rock saw? It may be time to invest in one*. 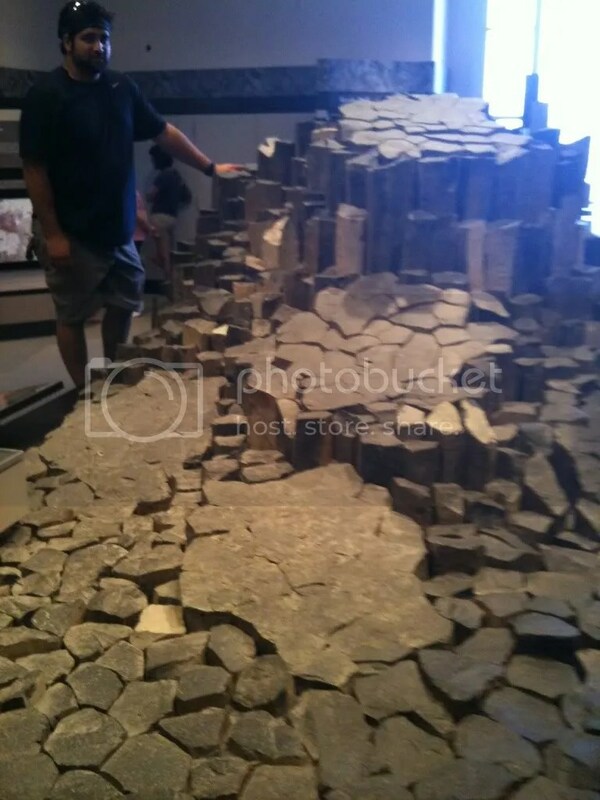 Here is Alan next to a cool display of columnar jointing. Gotta love those hexagonal shapes with their eye-catching 120 degree angles. Don’t look too long, buddy. 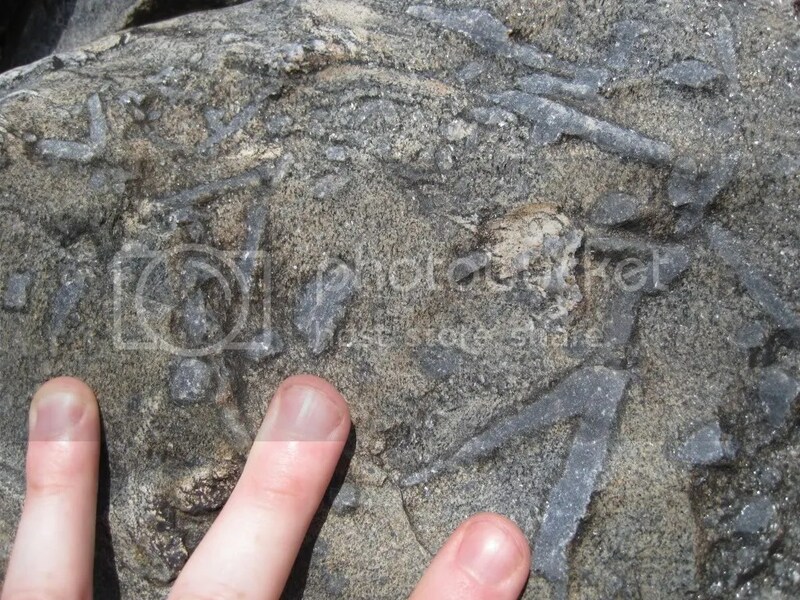 Those are underage (~12 million years old). Holy garnite! This is the point where Alan and I jumped to the floor and pressed our faces against this rock (good thing there is a “Please Touch” sign), and some passer by quipped “You guys must be geologists”. Don’t be so snide, guy, we know you’re excited too. If you remember my recent posts on porphyroblasts, these ones dwarf my examples, about the size of a softball or grapefruit. I highly suggest everyone go and check out the exhibit for themselves. There are also some great Burgess Shale fossils on the first floor, too. This was actually an accident. 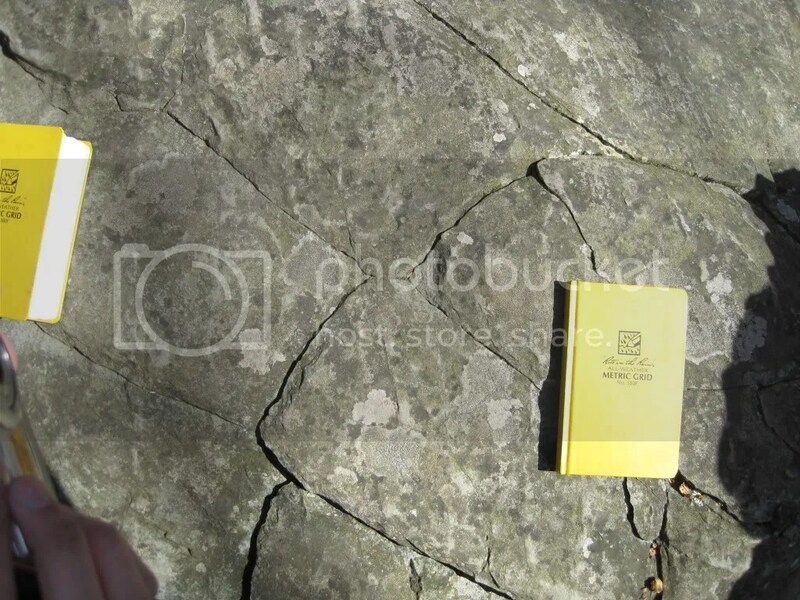 I meant to take a picture of this quartzite sandstone with a hand lens held up to my iPhone camera, but I took a video instead. I liked the outcome and here it is. Take notice of the blue quartz grains (about 1 mm in size). Alan and I found this beauty out in Fauquier County off of Cannonball Gate Road, possibly eroding away from the basement complex. The other object in the video is a penny for scale. In three of my earlier posts I discussed the Billy Goat Trail at Great Falls National Park in Maryland. On Wednesday (quickly becoming Geology Day on my calendar) the team (Alan and I) trekked back to the BGT to further explore the geologic features. This time around the water level of the Potomac was considerably lower than previous, and exposed more outcrops for us to observe. The bedrock of Great Falls was metamorphosed in multiple events, and evidence for these events is seen throughout the park. 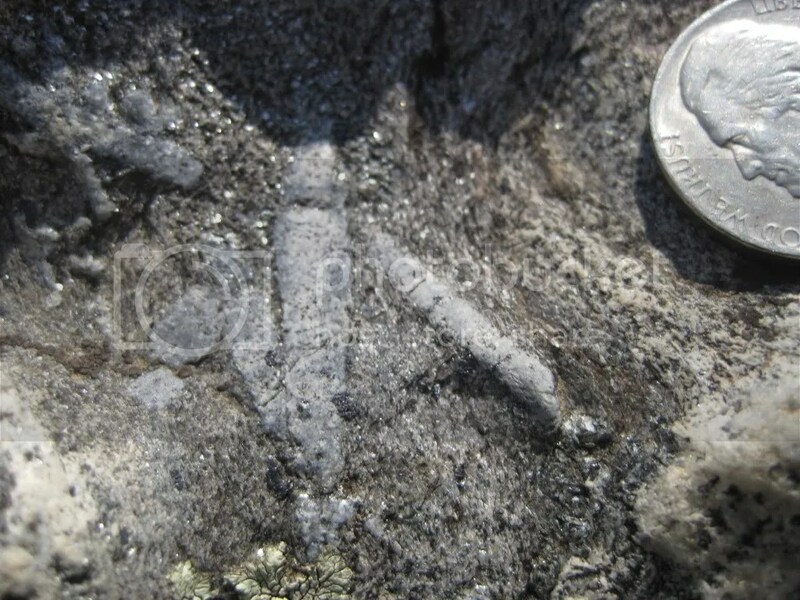 One piece of evidence is the presence of porphyroblasts found near the end of Mather Gorge in the heavily metamorphosed metagraywhacke. Porphyroblasts are large mineral crystals that form within a metamorphosed rock during periods of high temperature and pressure; one example is a garnet, the state mineral of Connecticut. When we first went through the BGT in April we came across a small sampling of porphyroblasts in the same vicinity. But, this time with more exposed rock we were in our own smorgasbord of porphyroblasts, boudinage, and kinematic porphyroclasts. Alan and I found five separate areas with the porphyroblasts, and could have found more if it weren’t for the blazing heat melting me to the rocks. One particularly good example is pictured below (pasty-pale hand for scale). The question now arises: what are the porphyroblasts made of? Well, at this point they are composed of sericite, but only after they experienced retrograde metamorphism. In other words, after the intense pressure and temperature that created the porphyroblasts began to diminish the composition of them changed with the environment. Well then, what were they before they were sericite? Well, I don’t know, and I am not alone. There is some level of debate for this topic as some parties believe it to be kyanite and others sillimanite. The confusion arises out of both being polymorphs of each other along with andalusite. Polymorphs are minerals of the same chemical composition, but differing crystal structures depending on temperature and pressure levels. 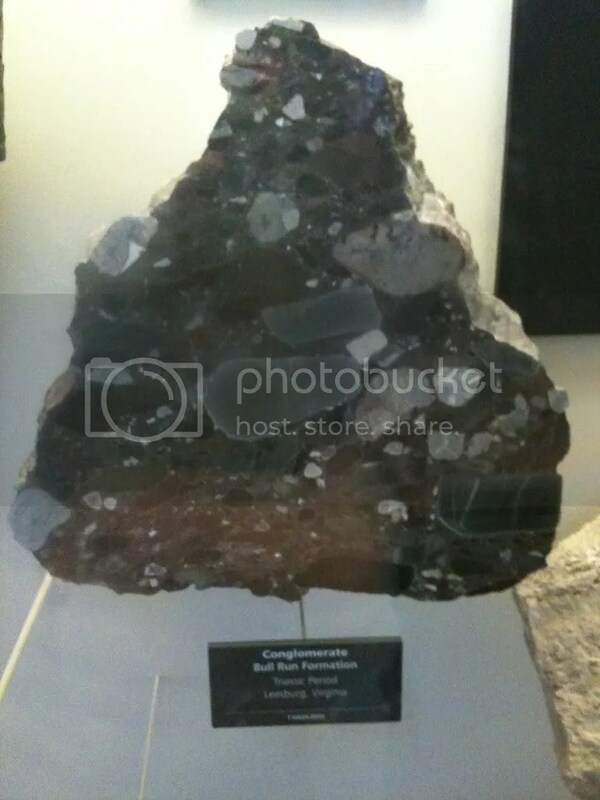 All three of our polymorphs discussed here have the chemical composition Al2SiO5, in relatively high pressure kyanite is formed while in high temperature sillimanite is formed. According to the USGS paper, “The River and the Rocks: the Geologic Story of Great Falls and the Potomac River Gorge” (1970) the porphyroblasts are sillimanite and suggests that they may have been kyanite and andalusite originally, but changed due to the heat from granite intrusions. 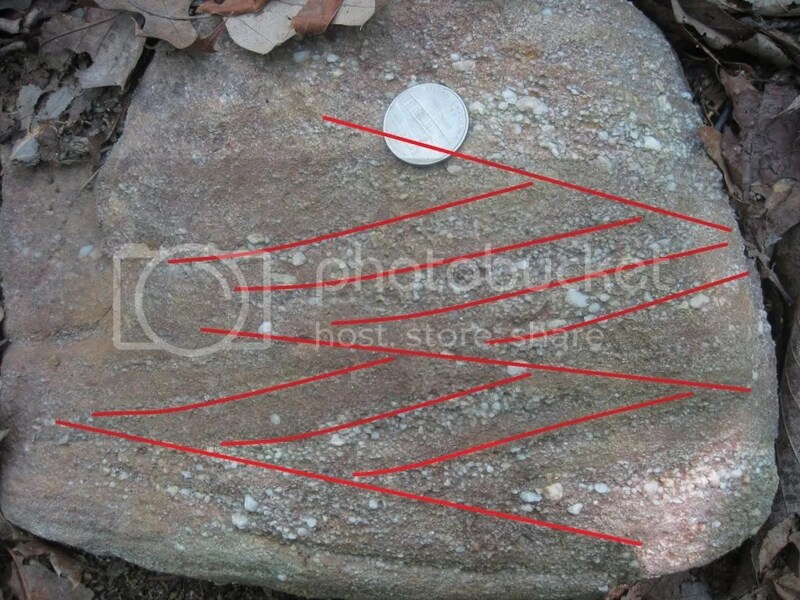 George Fisher’s paper “The Piedmont crystalline rocks at Bear Island” from 1971, and discussed by Callan Bentley in his blog entry: “Crystal Ghosts” (April 2010), suggest evidence that all three polymorphs are found within the park, and that this could imply the conditions were near the aluminosillicate triple point in terms of pressure and temperature. I like this idea, and not just because it presents a more interesting scenario, but because there is solid evidence for both sides of the argument. With the triple point hypothesis both scenarios are explained. I hope to have a better understanding once I complete the Igneous Metamorphic Petrology class, and will possibly explore the topic again then. For now I would have to consider the metamorphic environment of Great Falls during the Taconian Orogeny. Which would have been greater between temperature and pressure, or were both at the precise levels to generate all three polymorphs? 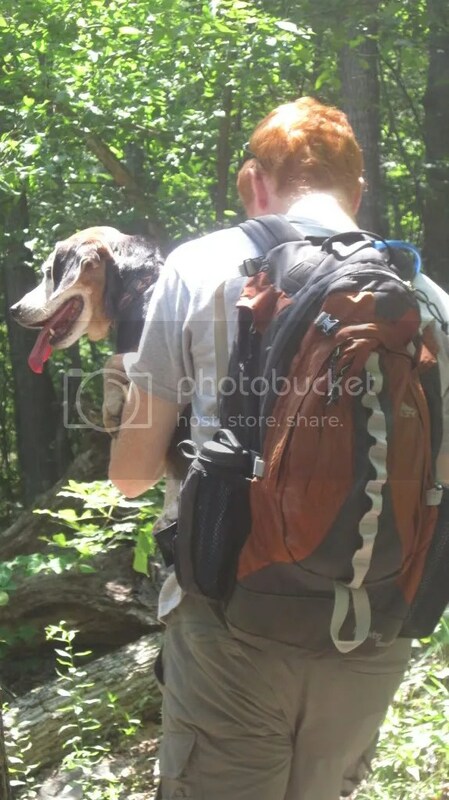 On Sunday, the family and I headed towards the Blue Ridge with the intentions of stretching our legs along the Buzzard Rock North trail. According to hikingupward.com this is an easy trail with a few great vistas along the ridge. While they were spot on about the views, the word “easy” is relative and I don’t think it related to us on this excursion. Not that it was difficult, just that it wore out our poor 11 year old pooch who I had to carry at one point. The trip was simply recreational and I had no plans of making anything geologic about it, though I did bring my rock hammer, hand lens, HCl, and chisel. Even still it is a hard skill to turn off and I noticed a few rocks that caught my attention. 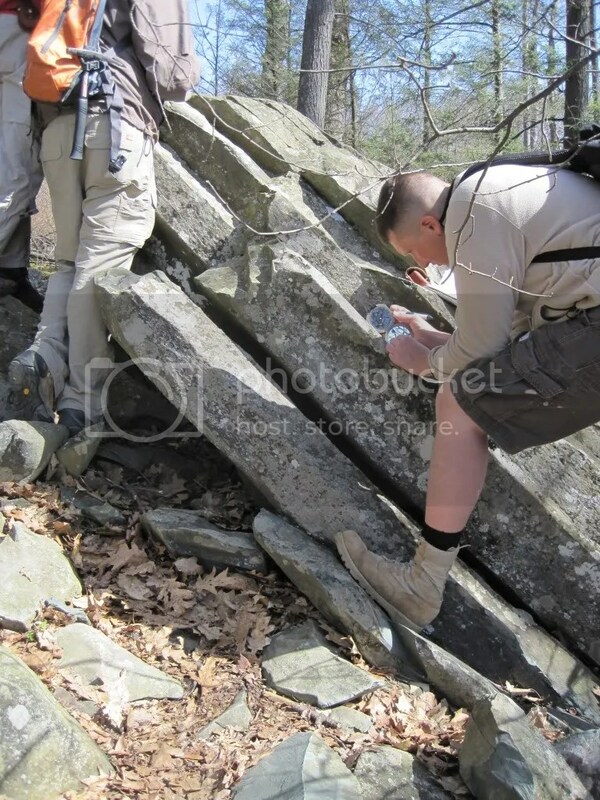 It should come as no surprise that Massanutten Mountain is comprised almost solely of the Massanutten sandstone (MSS). 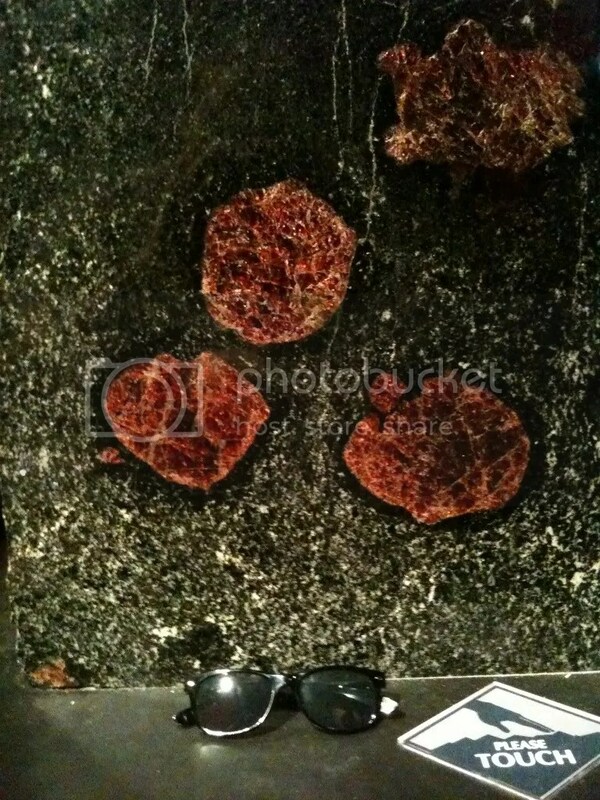 The MSS is a quartzite meaning that it is almost all quartz grains, therefore making it very durable. 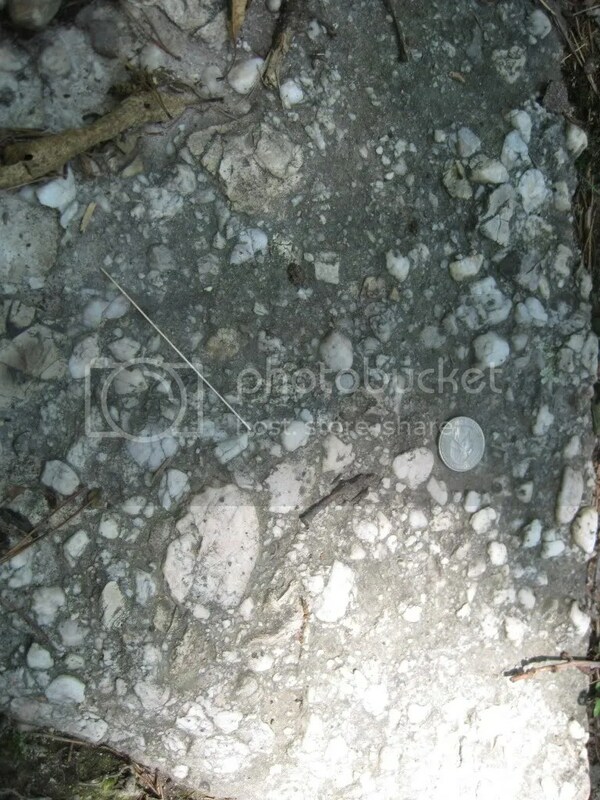 What I find very interesting, and what caught my eye along the hike, is the range in grain sizes of the quartz. 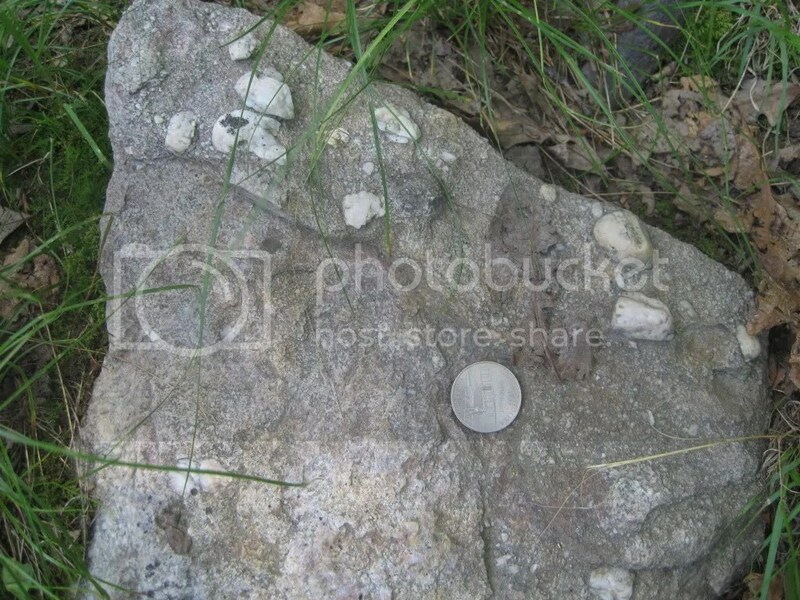 I found rocks of well sorted sand sized grains all the way to large pebbles in a conglomeritic rock. In all cases the larger pebbles of quartz were weathering away at a lesser rate than the smaller sand sized grains, making them pop out and be even more noticeable. In the rock pictured below the larger pebbles were almost ready to be plucked out of the rest of the rock. Along the hike there were nice examples of cross bedding seen in a lot of the sandstone. Since it may be hard to tell from the picture below I added some nifty red lines to help in the visualization. 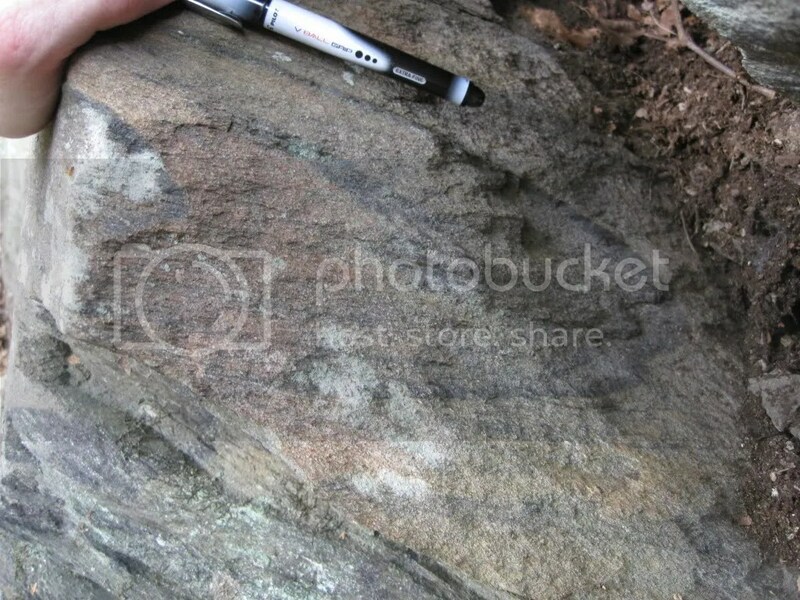 While this example is not in situ, cross bedding was seen in the MSS to show it was not overturned. The hike up to the first vista point is pretty straight forward, up and down a few hills, across a stream or two, but after that it gets more interesting. From this point the incline steepens, and your path is more likely to be MSS than the soft soil it was before. Once we reached the top (and took a desired breather) the trek along the ridge was full of great views of the Fort Valley and the other side of the basket. It was also visible that the beds of MSS were dipping towards the valley, some as steeply as 75°. Combined with the cross bedding orienting our paleo-up position this shows how Massanutten Mountain is part of a synclinorium. 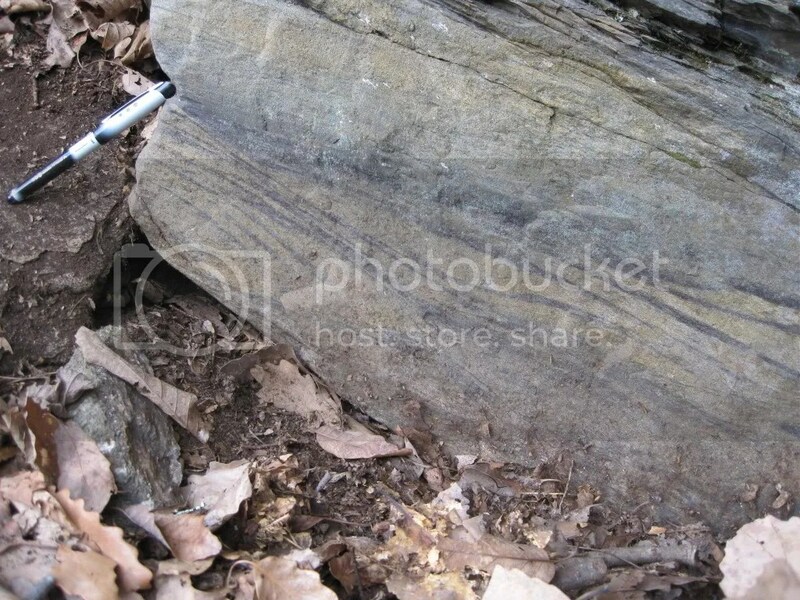 The entire valley is folded down in a syncline with parasitic folds as part of it, and the MSS is so durable it weathers away at a slower rate than the surrounding shale. Much like the quartz pebbles in the conglomerate, Massanutten Mountain sticks out in high relief of the valley. We were also privy to some wildlife besides the vicious attack dog we brought with us. Up top we saw one of Virginia’s two vultures, the black vulture, which is distinguishable by the white tips to its otherwise black wings. 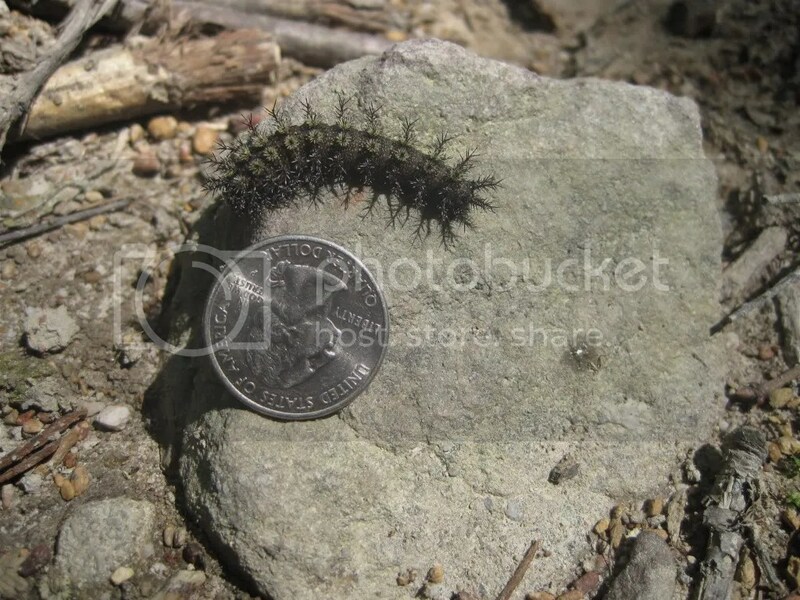 And along the lower half of the trail we saw this little guy who I think is a gypsy moth, though I am admittedly not great at identifying my caterpillars. The trip down was swifter and a little easier on the legs, though we were all pretty tired at this point. None more so than the dog who eventually just stopped walking and decided she had had enough. So let me ask you, who is the subservient one in this relationship then? At 0:17 the video switches to a point when the temperature was hotter. Notice how the movement becomes more intense. After spending an evening around a campfire spinning some good ole’ Ben Roethlisberger yarns, and good night sleep was needed. Unfortunately, we were in for a night of hurricane force winds. Not really, but it was pretty windy and the tent kept slapping me in the face all night. It must not be a fan of my low-brow satirical sense of humor. 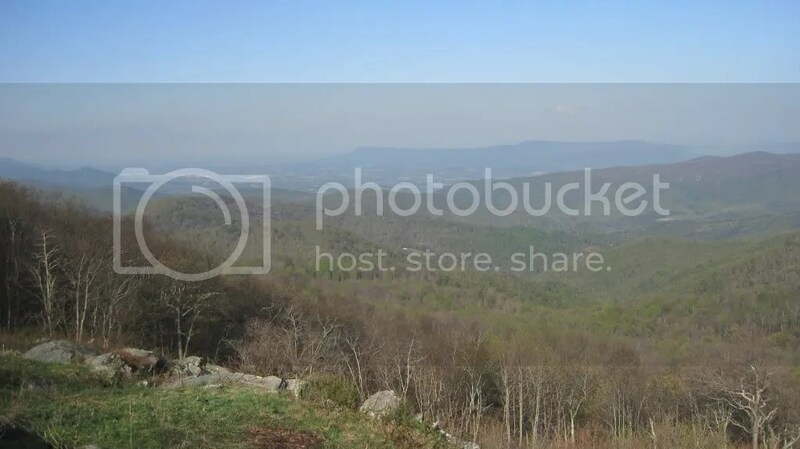 Today we hopped back in the van and headed out towards Skyline Drive; which if you don’t live in Virginia, is where city folk bring traffic to rural folk. 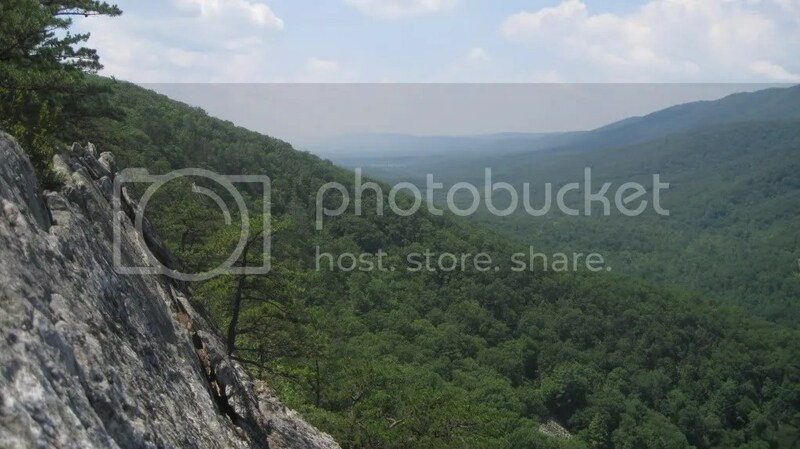 It is also a great place for some pretty spectacular views of the Commonwealth and West Virginia, and some pretty decent hiking trails. After making a few stops along the road at some beautiful, if not incredible windy, overlooks, we parked and set out down the Limberlost Trail (Google Earth file). What the Limberlost trail lacks in strenuous hiking it makes up in a two geologically exciting outcrops of columnar jointing in basalt flows. This basalt is part of the Catoctin Formation which flowed to the surface during the rifting of Rodinia. The Catoctin is younger slightly as the Swift Run in found beneath it. As the basalt cooled, it contracted and cracked, leaving (for the most part) hexagonal columns with arrest lines running perpendicular to the joint surface, for every period of jointing. The columns would have sat there looking like the Giant’s Causeway of Ireland for a few hundred million years until the Alleghenian Orogeny (AO) knocked them around. Taking the strike and dip of the columns, we were able to determine another instance of East over West deformation; further evidence of the AO coming from the east. The typical case of columnar jointing exhibits six sides with 120° angles between. After deformation the “tops” (since we were unable to determine paleo-up) of the columns were sheared and stretched to create larger angles or in some cases shortened (100° and 90°). The arrest lines which were originally perpendicular to the edges are now at angles of ~106°. After getting our gentile sufficiency of columnar jointing we headed back down the fire road to our vehicles, and were off to our campsite and then one final stop for the day (possibly my favorite of the trip). After leaving the Garth Run outcrop we drove collectively in our vans (one being far superior to the others) to an area along Route 33 just near the entrance to Skyline Drive. Here we pulled over, and piled out of the vans and into the woods. There was no trail for us to follow here, just a creek bed and an intrepid guide/professor. But, even in the rough overgrowth each member of the excursion made sure to mind their footing and the branches of troublesome trees… well, some of us anyways (not naming names). Even so, all of us were troopers and muscled on motivated by the promise of pizza. 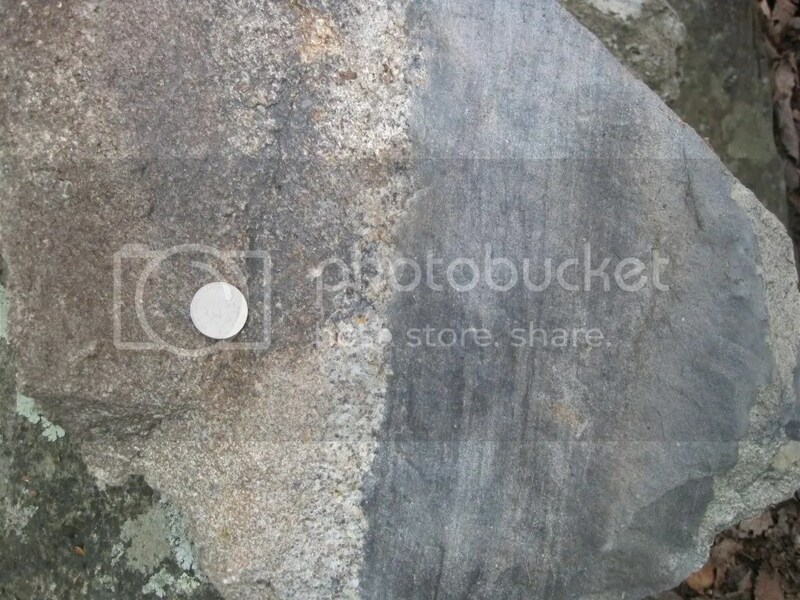 At the outcrop itself we saw sedimentary rocks instead of igneous/metamorphic this time. The Swift Run Formation (Google Earth File) is comprised of arkose sandstone and some finer sedimentary rocks including mud rip-up clasts that were not easily recognizable at first glance. Originally thought to be some type of xenoliths, these mud clasts were put in place by a large increase in depositional energy that tore these mud chips from the bottom and then displaced them amongst the sandstone. Further along the outcrop there was a rock that exhibited the transition from coarser to finer grain sizes drastically. There was also some interesting tiger-stripe-like foliation seen. 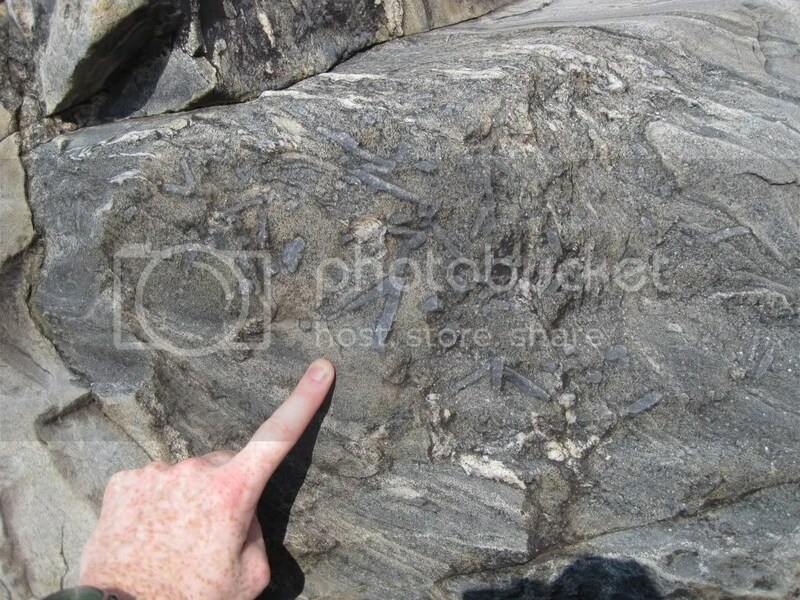 There was also evidence for tectonic effects seen in some folding. 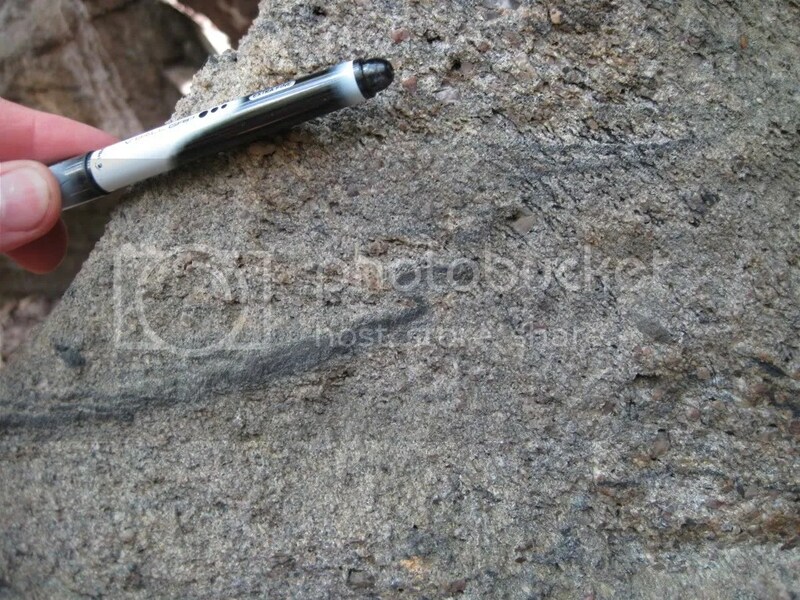 The first fold found was an overturned syncline that was only about 10 cm in length and found at the base of the outcrop. It was noticeable because the darker mud layers contrast nicely against the lighter grained arkose. Interesting about this fold and the second set found were smaller, in this case parasitic, S-folds found. In both cases the s-fold has an East over West, or sinistral orientation. This is because the orogeny was coming from the east, and would have pushed the bedding layers in such a direction. The Swift Run Formation was deposited during rifting of the super continent Rodinia. The sediments would have been deposited in an environment similar to modern day the Culpeper Basin. It overlays the basement complex seen at the first outcrop, but is underneath the Catoctin basalts that were deposited over top as rifting of the continent progressed. The folding witnessed here would be attributed to the Alleghenian Orogeny, which will be a common theme through the next couple of posts. After about an hour of pressing our faces up against the rock we made the trek back through the brush to the vans. We pressed onward to find the elusive 10-topping pizza.